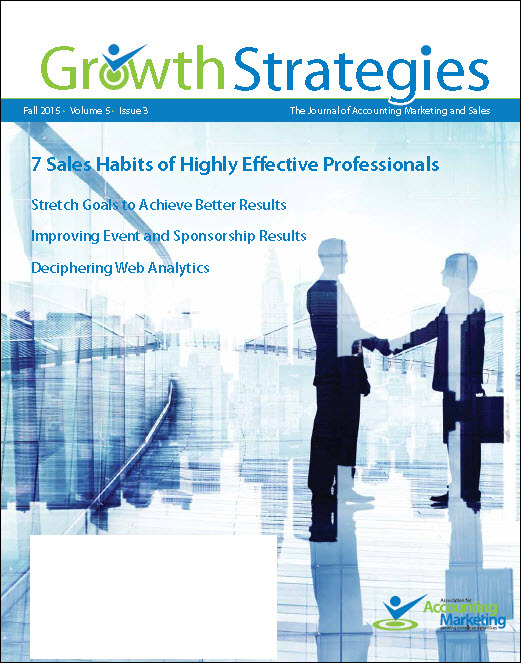 The Growth Strategies Archive holds all previous issues of Growth Strategies. This archive is available to members and subscribers. To access the archive, please Login. You can receive all of this great information in your own mailbox on a quarterly basis. Subscribe today! Industry specialization has become one of the most powerful ways to differentiate an accounting firm. As firms look to solidify their reputations as industry experts, many strike up strategic relationships with other businesses that target the same industry. From co-marketing initiatives to formal joint venture agreements, find out how your firm can unlock new pools of revenue. If firm leaders could do only one thing to become more future-ready, it would be to re-examine the traditional, pyramid-shaped business model in place at most firms. Get more of Mark's tips for firm leaders. for professional services organizations, three emerging technologies deserve special attention. Read on to find out what they are. Contrary to popular belief, referral relationships aren’t just for Partners and professional staff. Marketers have a unique opportunity to play an integral role in the referral and business development process. Find out how Marketers can build a referral network that will ultimately save money and contribute to the success of your firm. There is a new sales economy, created by the ever-changing dynamics of business, technology, and culture, that is changing the way that clients and prospects buy. But even with these changes and increased reliance on technology, it’s still the value created through a relationship that remains at the heart of the most successful business development. This article shares three principles of social capital in modern business development and provides an equation for building strategic relationships that will help business developers earn new business and develop long-term client value. Think about the most memorable piece of content that you read, listened to, or watched. What made it so irresistible? Why did you devote the time and attention to stick with it until the end, despite all other distractions? Now take a fresh look at your firm’s content. Would it make you want to engage with the firm by clicking on another piece of content, filling out a contact form, or picking up the phone? Effective content aligns with that buyer’s journey by addressing pain points and answering the questions that come up along the way. Buyer persona development, a business-to-consumer marketing tactic that has become increasingly popular with business-to-business firms, puts the “know your reader” concept on steroids by supporting your internal assumptions and inferences with actual research and first-person interviews. It’s your worst public relations nightmare: A huge chunk of client data—including social security numbers, addresses and other sensitive information—may or may not—have been compromised due to a hack in your IT structure. What do you do next? Enter the crisis communications plan: A finely-honed scenario plan that anticipates the most likely crisis issues your firm might face. The plan includes details as to who, what, how, and where resources are to be deployed. Sounds dreamy, but what if you don’t have a plan and there is a breach? Most firms realize an average level of growth while others constantly grow at a much higher rate. What makes one firm achieve more than another? The Hinge Research Institute (Hinge) found out what high-growth accounting and financial services firms are doing to achieve a 20% or higher compound annual growth rate. As reported in its report on the 2018 High-Growth Study, high-growth firms market and promote their businesses differently. They focus on strategic marketing tactics that deliver a higher return on their investment of time and money. Five experts share their thoughts. What one important relationship marketing tactic do you feel has helped improve client engagement the most, and what metrics do you produce to prove its value? Behind the scenes with a featured marketing expert. Q&A with Ryan Suydam, loyalty expert and co-founder of Client Savvy. You Signed up for the AAM Summit. Now What? Practical tips from seasoned marketers on how to make the most of your summit experience. The General Data Protection Regulation requires that individuals intentionally opt in (in writing, electronically or verbally) to receive communications from a company. Companies in the European Union (EU) have been preparing for the General Data Protection Regulation (GDPR) for a couple of years. As information on GDPR is being covered more frequently by the U.S. media, many firms are beginning to take notice and ask whether they will be impacted. Generally, GDPR applies to businesses that handle personal data on individuals in the EU. A company could be required to comply with GDPR standards even if they are not physically located in the EU and they do not transact business in Europe. To all but the largest professional service firms, the idea of having a full-time business development professional who spends all their time working on a select few accounts instead of hustling around finding new clients can seem counterproductive. At the very least, it seems duplicative to what the key relationship partner or partner-in-charge of the account is supposedly doing. But, here is where most firms get it wrong. To keep your high-performing partners, they need to keep doing what they do so well and have more time to do it. The highest and best use of evaporating time is to have the right people doing the right things, at the right times. This is where a key account executive comes into play. There’s something exciting about adopting new technology, especially if you can influence your team to help drive change. We’ve all looked at our email list and thought, “This list is getting stale and it’s shrinking.” No matter how beautiful your email templates are, people are going to unsubscribe. But the question is, how do you capture new leads so that your email list stays on point? Baker Tilly is accumulating proof that its diversity and inclusion initiatives are strengthening its culture and client service. The firm is winning regional and national ‘best place to work’ lists. It has persisted with national women’s and diversity initiatives, and it uses data from employee surveys and national benchmark studies. Leadership has ironed out a consistent message construct to deepen staff awareness when talking about firm culture, internally and with clients. But, even with all these strides forward, the firm is still proceeding with extreme caution when it comes to using marketing techniques to share its accomplishments. Given the fractious and fragmented national debate about workplace behavior, culture, and accountability for how women and diverse staff are treated, is it any wonder? In this regular column, we ask five members to comment on a specific topic of interest to members. 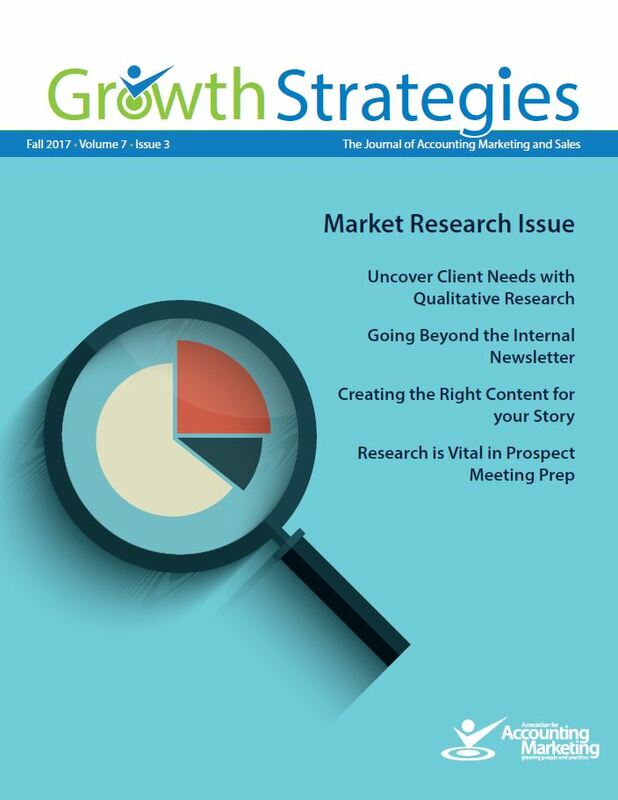 In this issue we asked marketing leadership from Ericksen Krentel LLP, Freed Maxick CPAs, PC, BKD CPAs and Advisors, Williams, Benator & Libby LLP, and Boyer & Ritter, LLC to give their insights to the following: What one fresh marketing idea will your firm be implementing (or refreshing) in 2018 and what area of your marketing strategy plan do you expect it to impact the most? There are many different qualitative research techniques to understand market dynamics or gather insight into decision-making processes. Identifying the right methodology, knowing what questions to ask, and ensuring an unbiased interpretation of the information is a researcher’s job. Being an informed participant in the process is often the best approach to getting the most from your marketing research efforts..
Why is it important for a marketer to be a team player for employee engagement? If you look on CPA firm websites, you will read many open-ended declarations like “our people are the firm’s number one asset.” Statements like this have marketers showing their hand in engaging employee participation through branding communication initiatives. This article explores examples from a variety of firms for getting employees to become more engaged in your firm’s growth efforts. In a world of content overload, how do you make your story pop? Selecting the right type of content to showcase your story is a powerful tool when it comes creating your content strategy. This article covers the different types of content you can use to share your story in the most effective way possible. 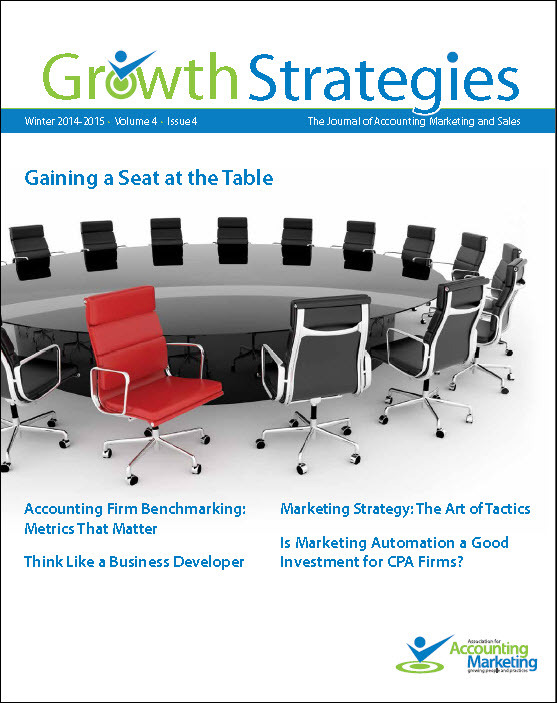 Accounting firms need innovative ways to differentiate their firm from the competition. While many firms promote the value they bring to a relationship as a thought leader, others focus on creating more value for clients by delivering a service that solves their problem. 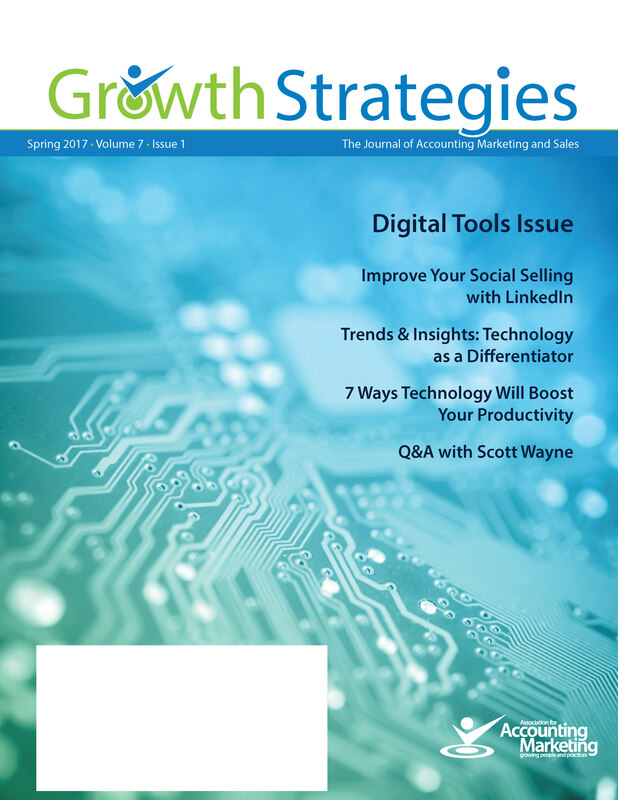 Learn how high-growth firms use technology to set uniquely stand out in the marketplace and gain a competitive edge. Is there such a thing as being too prepared? Doing research ahead of a prospect meeting positions you to be more likely to connect with the prospect on a personal level and understand the organization’s business issues and opportunities. It also communicates how seriously you take the prospect’s time and the opportunity they have given you. Whether it’s a phone call, a meeting or a proposal, researching a prospective new client on the front end helps you to organize your thoughts, build an informed and tailored framework for your discussion and be prepared to listen and react constructively. Rolling out a Customer Relationship Management system isn’t a quick or easy process, but many marketing professionals are finding it to be the right decision as their firms continue to grow. Two marketing directors discuss their experiences with CRM and offer their recommendations for others. 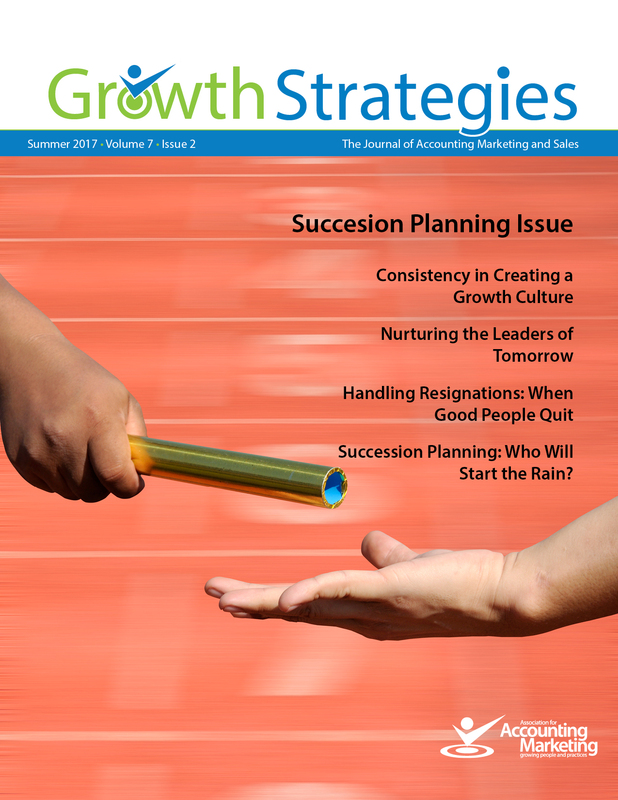 Succession planning continues to be an issue at accounting firms in part because they don’t have a culture that encourages growth. This culture must be purposely built; resulting in clear strategy, enhanced accountability and better employee recruitment and retention. Rainmaking must be taught at all levels starting with first year staff accountants. Training doesn’t stop when one makes partner either as each individual should continually improve rainmaking skills throughout their career. Firms that invest in their people are the ones that experience growth and develop stars at every level. Succession then becomes easier as everyone works together to obtain and serve clients. How do you build a firm of inspired, engaged, and experienced individuals who are ready to take your firm to the next level? Nurturing the future leaders of your firm is critical to not only the culture and values of your workforce, but also to creating a succession plan for retiring partners. With a few key tactics, you can create a thoughtful process for passing the torch to the next level of management and have an entire pool of industry leaders ready to take your firm to the next level. When good employees leave, relationships change. CPA firms face the challenge of balancing a positive relationship with future alumni; protecting their intellectual property and confidential information; and processing the emotions that come with losing a trusted team member. Exit-branding practices - how you care for your employees when they initiate a departure - impact reputation, goodwill, and recruitment, but are often overlooked. This article offers suggested procedures for receiving employee resignations and provides best practice recommendations for maintaining relationships with former employees. Succession Planning: Who will start the rain? For many small to mid-sized firms, the origination metric for professionals usually doesn’t become significant until the senior manager or partner level. By then it could be too late for some firms and undeniably leave them with limited succession choices. When creating rainmakers, firms often choose between two distinct strategies – focus only on a subset of employees who have a business development mindset or invest in teaching everyone in the firm the concepts of marketing and business development. This article explores the impact and expectations of each strategy. The shortage of qualified staff and challenges of retaining, developing and mentoring staff are the top issues keeping managing partners up at night. While employees leave firms for many reasons, there is a growing concern that the industry’s outdated operational model of is a major contributor. Recent results of several American workplace studies all point to happiness and purpose as powerful drivers of success in an organization. This article explores why happiness is good for business and includes free resources that can help you build a happiness-based culture within your firm. LinkedIn is tracking social selling in every industry and in every region at a very fast pace. Professionals can grow revenues by approaching people through social media networks in personalized, meaningful ways. In this Q&A, explore the keys to effective social selling, profile must-haves, content sharing tips, success measurement tools (Social Selling Index) and an overview of LinkedIn’s Sales Navigator product. Urchin Tracking Modules (UTM) track performance of your marketing campaigns in Google Analytics. Throughout 2016, Friedman ran an integrated content initiative and measured the performance of the campaign elements. The associated UTM metrics revealed what worked best, what could be improved and what generated the most conversions and leads. “There’s got to be a better way.” For those who utter this daily, we introduce you to the personal productivity tech stack. This group of technologies can give you more bandwidth by improving how you manage your most persistent tasks, allowing you to focus more energy on what you do best. Your buyers are at different stages in the buying process when they visit your website. Buyers can be scared off (or annoyed) if you approach them too soon. With or without a marketing automation tool, learn how you can create inbound marketing processes that are proving to be more cost-effective than direct mail, tradeshows or advertising. 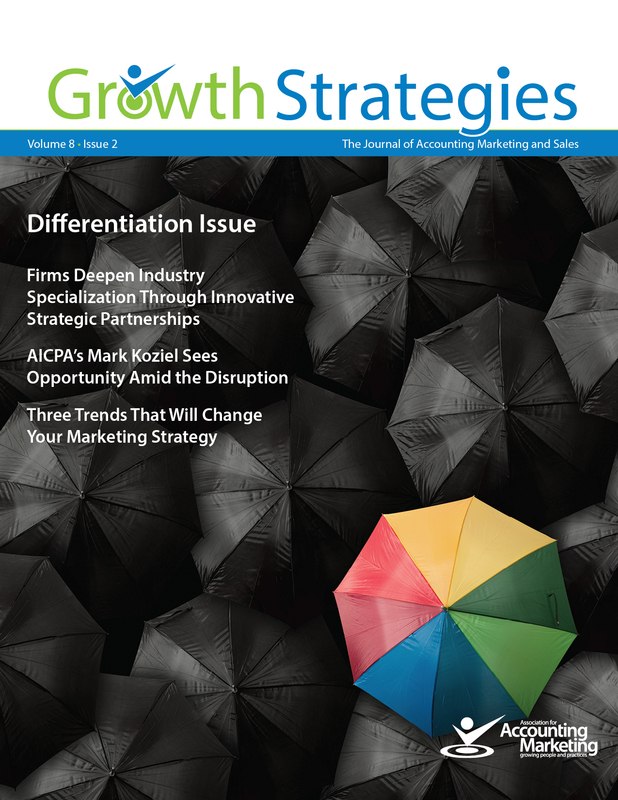 Accounting firms need innovative ways to differentiate their firm from the competition. While many firms promote the value they bring to a relationship as a thought leader, others focus on creating more value for clients by delivering a service that solves their problem. Learn how high-growth firms use technology to set uniquely stand out in marketplace and gain a competitive edge. The problem with digital marketing is that it is not a simple media buy. Any medium you’d look to incorporate has rules of engagement, which if not followed, can lead to wasted spend. Explore the pitfalls and value opportunities of Pay Per Click (PPC) related to lead quality and ROI transparency, along with examples of in-house or outsourced platforms that optimize lead flow and data-centric marketing. 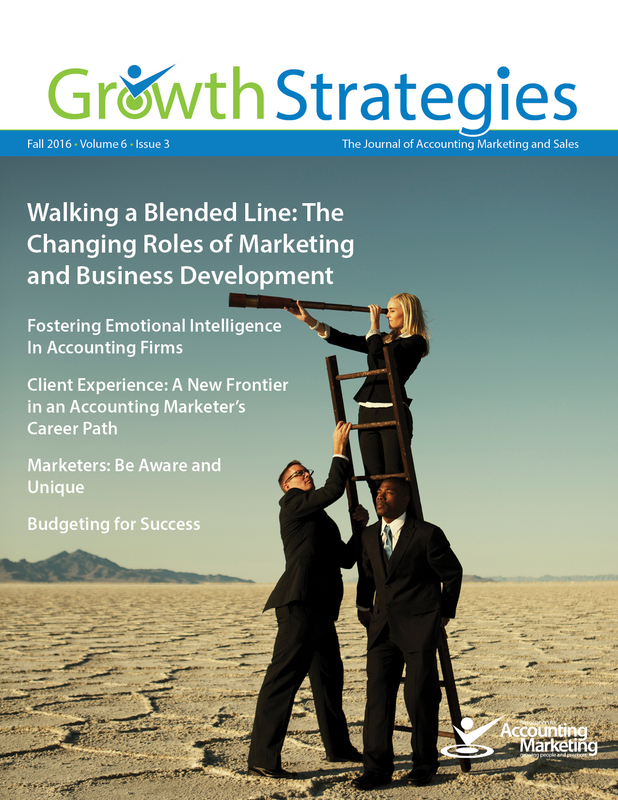 Buyers of accounting services are growing more demanding and price sensitive. How can your firm break through those defenses and build the kinds of relationships that lead to profitable engagements? Two social networking experts share how to use “content as currency” to become more visible in social networks and more valuable to buyers. It’s a good bet your CPA firm utilizes digital marketing to create lead opportunities and drive brand loyalty. If so, your task is straightforward: Develop and deploy fresh and relevant content on your website, and promote it through social media and outreach platforms to help partners, principals and staff convert site visitors into new business. In the article, “Using Analytics to Drive Content Decisions and Drive Leads,” we highlight some of our favorite methods for collecting rich insights from websites, and we share examples that detail how these methods can be utilized. Examples include: (1) Google Analytics: Through these reports, you can learn which landing pages drive the most traffic—then streamline your content accordingly. (2) Google Search Console: This tool provides a listing of the search terms that people type into Google and, ultimately, use to land on your site. (3) Heatmap: This software informs of you of behavioral patterns of your site visitors, which allows you to make informed decisions about where to place specific messaging and call-to-action requests in priority positions. Since traditional accounting services are considered a commodity, is can be difficult to differentiate your firm from the competition. It is imperative for marketers to present the unique value their firm can bring to a relationship. High growth accounting firms are branching out and offering business advisory services in areas such as wealth and investment management, CFO, human resources, training, and information technology. 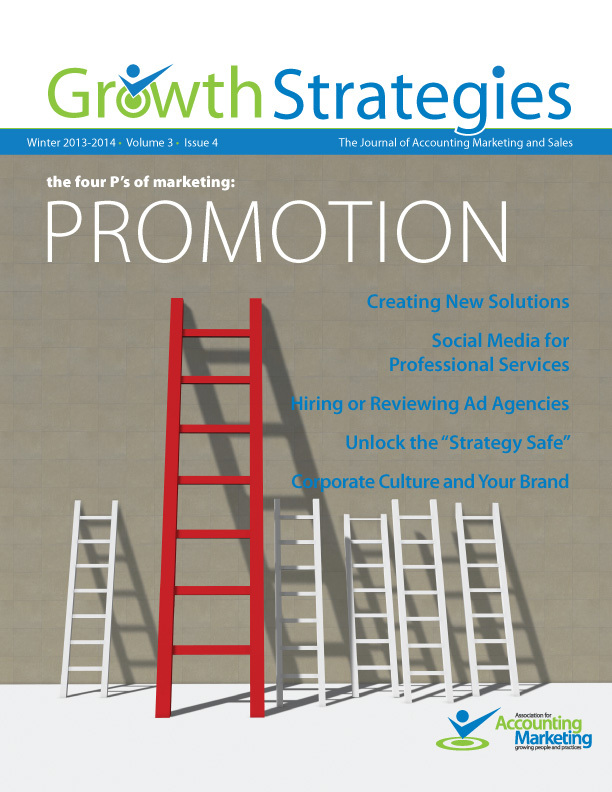 Innovative firms are taking it one step further by offering marketing services. KPMG and Deloitte are among the many firms that are either buying advertising agencies or investing in the talent and expertise to form their own marketing services group. It is estimated that eight of North America’s top advertising agencies are now owned by Big 4 accounting or other large consulting firms. This article discusses the many benefits firm realize by offering marketing services. A case study is also presented on the high level of success Skoda Minotti has achieved. In Take the Shortcut to Growth, The Accountable Growth™ Coach suggests three straight-forward steps and detailed tips to streamline your firm’s time and money investments for faster growth: (1) Identify your “Next-Gen” Growth Leaders with the help of proven characteristics. (2) Use the scorecard to assess “Growth Leader Mindsets” against eight criteria that have been developed with input from hundreds of professional service firm partners and senior managers. Potential Next-Gen Growth Leaders can anonymously complete the scorecard and see how they compare to others by visiting http://www.accountablegrowth.com and clicking the “Growth Leader Mindsets” button. (3) Launch a “Next-Gen Growth Leaders Program”, sponsored by an active senior leader and facilitated by a seasoned coach (internal or external). Follow the recommended approach fastidiously. Take the Shortcut to Growth and expect increased engagement, effectiveness and results from your Next-Gen Growth Leaders. This Accounting Podcast Is Boring Booming! When Rea & Associates set out to launch unsuitable on Rea Radio in the fall of 2015, the firm’s practice growth team’s objective was simple: produce a podcast that would accurately reflect Rea’s unique culture while demonstrating the expertise of the firm’s industry leaders. Today, just over one year later, the podcast has racked up more than 11,000 listens on SoundCloud (with about 200 new listens every week), established a loyal fan base, received several national and global accolades and, perhaps most importantly, has positioned many of the firm’s experts as thought leaders in their respective fields. Read on to learn more about Rea’s successful podcasting endeavor and walk away with some best practices you can use infiltrate the airwaves with your own show. 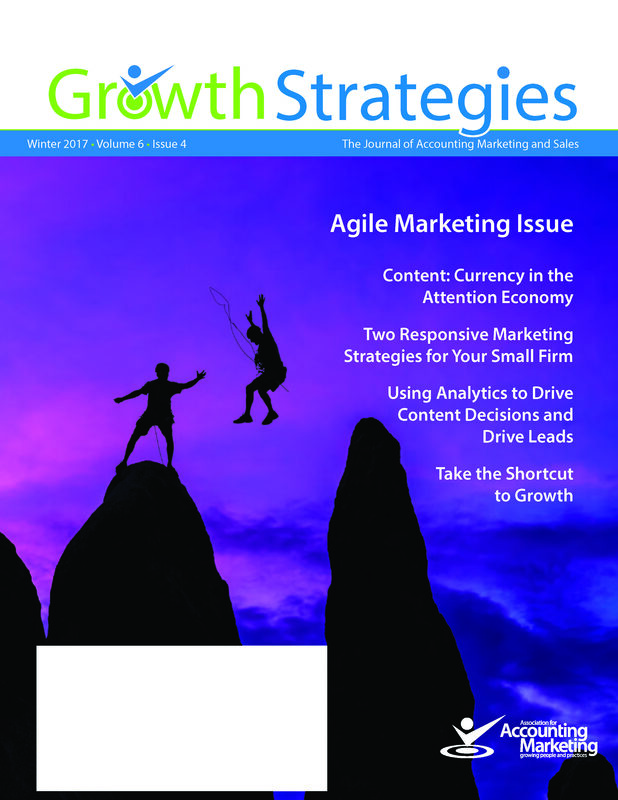 Political uncertainty is an opportunity for accounting firms to apply agile marketing techniques. In this article, K·Coe Isom’s Debra Helwig explains how her firm capitalizes on uncertain situations by creating timely, explanatory materials and using them to reach out to customers and potential customers. By staying agile, the firm creates credibility, anticipates guidance that customers need, uses expertise to lead conversations that can shape policy and support businesses, and reminds customers that they are not alone in facing changes. Emotional intelligence (EI) is one of the single biggest predictors of success in all types of jobs, and yet many dismiss emotional intelligence training as “fluff” or “soft skills.” These individuals most likely are not aware that nearly three-quarters of organizations that perform EI assessments report positive revenue growth, compared with 56% of organizations that don’t assess EI. Marketing and business development professionals can make a profound impact on their firms by helping to foster emotional intelligence that their professionals need to connect with and engage clients and potential clients. In this article, learn how Top 10 accounting firm CliftonLarsonAllen is improving its professionals’ “intelligence quotient” and building better business developers in the process. In recent years, we have witnessed the continuous evolution of marketing, not just in this industry, but also as a profession. The rapid advancement of technology has enhanced opportunities for brand recognition and awareness, yet this is still very much a relationship driven profession. The client experience involves both pieces, as it relates to communication and messaging from a firm (its brand promise) and the face-to-face client service and relationship (execution of the brand promise). A new career path has emerged in the CPA profession that is perfect for marketers because it pairs traditional marketing areas of focus with client feedback and training to further develop a culture that is centered on the client experience. In this article, Leisa Gill and Mitch Reno provide insights into their new roles and the rewards that they and their firms have gained in the process. The conundrum for today’s marketing and business development professionals can be summarized this way: every firm views marketing and business development differently, and every firm gives different latitude and responsibility to the person who sits in the lead marketing/BD role. As a result, there is a lot of confusion about what skills we as professionals need to have in order to be successful in the future, and what systems and leaders the firms who want to be best-in-class should put in place to manage marketing and sales. To cut through the confusion and get a glimpse of what the future holds, we talked to a handful of leaders across the country who have a wide range of different titles and responsibilities, but whose perspective is similar on what really matters on the path to creating a firm known as a client acquisition powerhouse. When it comes to preparing an effective Marketing budget, proper preparation and a thoughtful strategy are key to gaining support and ultimately reaching success. In a world (and industry) focused on the numbers, it’s increasingly important to approach the preparation and presentation of your budget with confidence, strategy and most importantly — full understanding of your firm and department. Find out more about the ways in which you can tackle your budget like a pro and get the best results for both you and your firm. 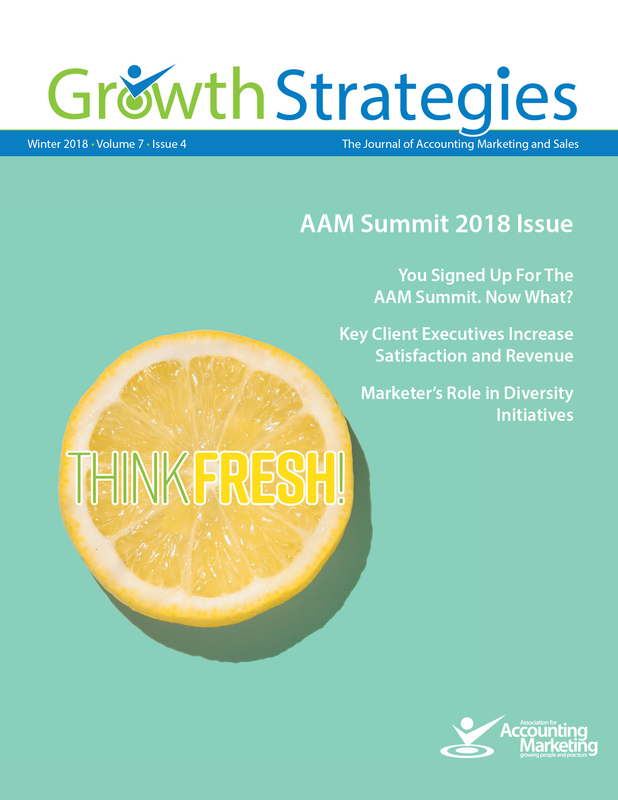 While Katie Butler and Ian McManis share AAM’s 2016 Rookie of the Year title, each have different experiences and unique perspectives on the accounting marketing profession. Butler is a one-person marketing department working with more than 65 professionals at Houston-based Weinstein Spira. McManis works within a marketing department of four people serving the 150 professionals of Cincinnati-based Barnes Dennig. Growth Strategies invited Katie and Ian to discuss their perspectives on the future of the Accounting Marketing profession including evolving marketing roles, client service culture, the rise of review sites, mission-critical marketing tools and how marketers should best invest in themselves. This article explores the significance of social media in the decision-making process and delves into the need and opportunity for online content marketing. It discusses how to move partners from waiting in a country club for their next lead to using LinkedIn to build a cult of followers that bring in business. It provides best practices and approaches to content marketing creation (e.g., how to get your partners to write) and sharing. It looks at how to make your partners into thought leaders through practiced sharing and calculated approaches that balance the sharing of third party content and original firm content. It’s an increasingly mobile world. But don’t panic if your organization isn’t prepared — financially or logistically — to develop an application for Apple’s iOS or Google’s Android operating systems. Leverage today’s popular platforms to tap into the power of smartphones and other internet-enabled devices. From email and video to social media and responsive websites, hitch a ride directly to clients, prospects and others faster and with less expense … no app required. In this article, we dispel many of the misconceptions around referral marketing—the lifeblood of accounting firms. Learn how to make the most of the marketing and business development techniques that help your firm capture referrals and turn them into clients. Practical steps shed light on how to develop a content strategy that supports your business goals. Last year’s AAM Marketer of The Year shares best practices on how convert to digital leads into sales. YouTube is the second-most-visited search engine on the Web. Some firms are grabbing their share of this traffic by creatively using video. 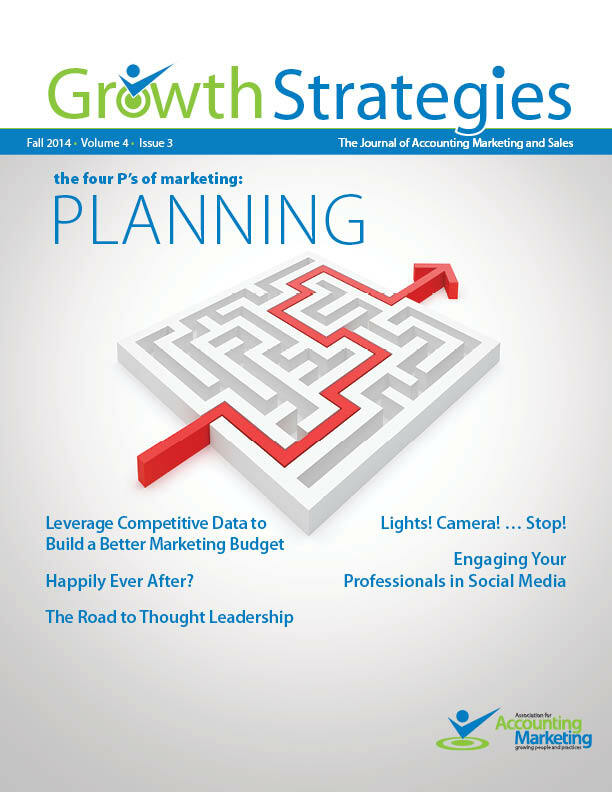 Read how two early-adopter CPA firms successfully added video to their marketing mix. Recruiting talent is one of the biggest challenges facing the accounting industry. Learn how social media strategies are being used to fulfill recruiting needs. Navigating the ins and outs of a merger can be a daunting task. This article offers guidance on how to succeed. From educational workshops to sponsorships, the marketing team can help drive these programs forward. Growth-minded managing partners questioning whether to hire professional sales people. This article lays out some criteria to help in the decision-making process. Learn about what the code means to AAM and its individual members. Do you believe you are paid fairly compared to your peers in other industries? One survey indicates that the majority of accounting marketing and business development professionals don’t believe they are. This survey provides firms with a comprehensive set of salary benchmarks. Selling is not the forte of most accountants. This article simplifies the necessary elements. When you use goals to give yourself focus and guide your actions, you and your CPA firm will achieve greater success. These best practices aim to capitalize on opportunities before, during, and after an event to give marketers the best probability for ROI success. Each year, the analytics offered by digital platforms gets more sophisticated. But with that comes the fear that we are measuring the wrong data. Marketers are achieving partner, principal and chief marketing officer status. Hear how three of them did it. 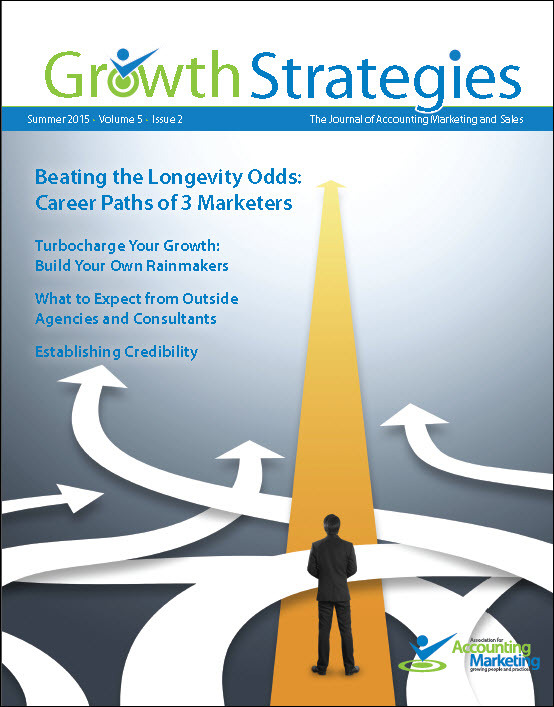 Building more rainmakers seems like a reasonable way for firms to accelerate their growth. But how? A glimpse at what our peers look for in an agency relationship and what matters the most to their firms. Does more than a decade of accounting marketing experience prepare you for a new job in another firm? What Is Marketing’s Responsibility with Respect to ROI? Partners love to measure. The problem is that what they measure is not always the same as what marketing measures. This article shows examples of how focusing on the right ROI can move marketers closer than ever to becoming a prime factor in driving firm revenue. This article is more of an assessment tool, or one of those consumer magazine quizzes on steroids. It provides a Growth and Sales Culture Rating Sheet to score your firm on each of 10 variables. At the conclusion of the process, you’ll be able to tabulate the rating and get a better understanding of where your firm is today and what adjustments it may need to improve its sales and business development capacity and culture. Doesn’t the name say it all? For years, firms have been complaining about this very topic and most problems stem from poor user adoption and commitment. Hear about some real-life scenarios gone awry and learn how to avoid making the same mistakes. This article outlines proven ways to build a marketing and business development plan that can make a profitable difference for your firm and earn you the attention of key decision makers. Knowledge of traditional firm metrics will help marketers speak the language of firm economics and better connect with partners on the issues that are of most concern to them. Differences in perspective directly impact how marketers and business developers approach ideas, opportunities, initiatives and even personal interactions. Learn the steps to positioning the marketer as a business partner. 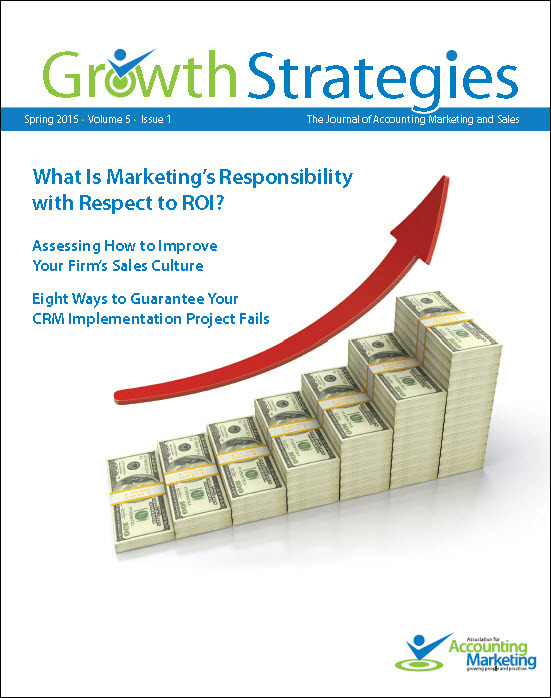 Is Marketing Automation a Good Investment for CPA Firms? It’s easy to get excited about what marketing automation software can do. Making it work in order to pay off the investment? Not so easy. Learn how your peers/competitors are spending their marketing dollars and use this number-rich article to talk to your partners about reallocating your budget. Marketers aren’t always among the first to know about a merger, but they clearly play an important role in successfully communicating the new message to clients and prospects. 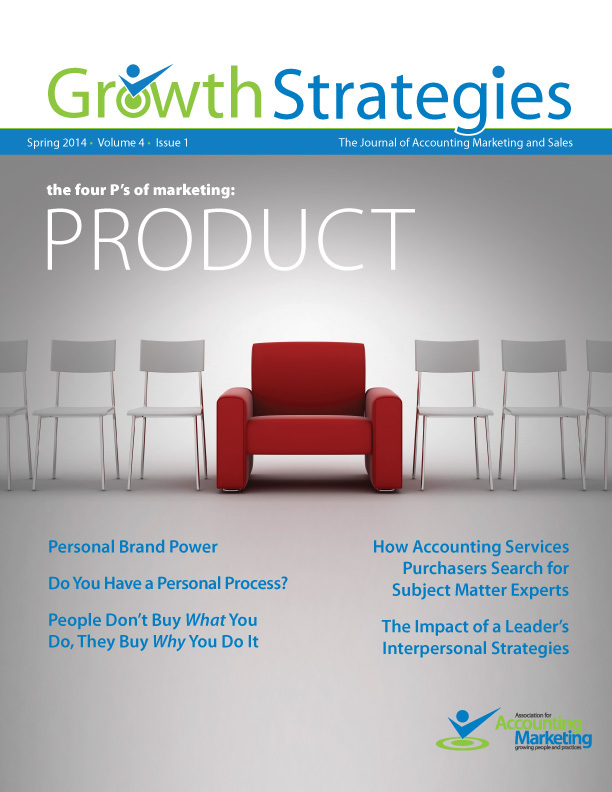 Advice from some of today’s most respected thought leaders in the accounting profession. Video may be among the hottest new trends, but don’t dive into it without thinking through why and how. Social media is not new, yet firms continue to struggle with which channels to embrace and whom to involve. 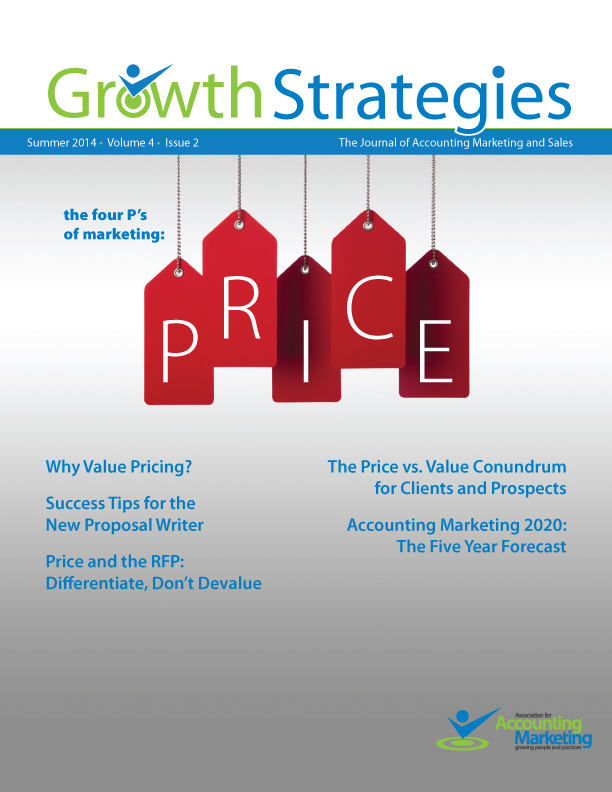 Improve your pricing strategies by focusing on deliverables, results and outcomes. Create sales documents that stand out from the pack in both content and presentation. Approach your RFPs with the intent to rise above the battle for the bottom price. Uncover your prospect’s underlying needs, wants and fears for powerful proposals. Do You Have a Personal Process? Some professionals are blessed with a natural propensity for practice development. For those without such gifts, a more disciplined approach can lead to greater market success. Prospects buy with both logic and emotion, and when firms capitalize on the latter, their connections — and results — improve. What does it take to be an effective SME? Besides pure desire, a measured approach can lead to better personal branding. Accounting marketing professionals need to focus on their firm’s brand as well as the personal brands of their professionals. And it starts at the top. Many firms talk about new solutions, but like many product introductions, they fail. Here are some considerations to drive success. Social media is the rage in B2B marketing, but how can a firm manage that process effectively with multiple partners and a myriad of online channels? The right agency can be an ally and brand builder to the marketing professional, but the wrong one can lead to costly frustration. Unlock the “Strategy Safe” and Watch Your Firm Grow! Your people are your brand, and your brand is your people. In this article, a marketing veteran of multiple industries frames the brand values related to firm culture. Accounting firms have an opportunity to take a leadership position in a nascent but growing niche. While demand for sustainability assurance in the United States lags other countries, CFOs and other C-suite leaders are becoming more engaged in corporate sustainability reporting and are starting to demand high-quality assurance of those reports. 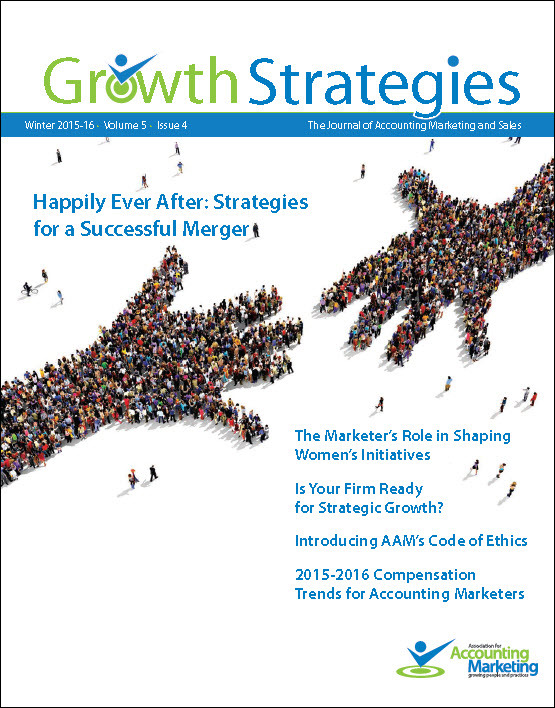 Mergers and acquisitions are a current trend in the accounting industry. Firms are looking to expand and cast a larger net to serve clients and generate new business; mergers and acquisition is an effective way to do this. Are You Incorporating Predictive Analytics Into Your Plan? Imagine if you could predict today what a client or prospect will do tomorrow and apply that knowledge to your marketing and sales efforts. In this article Chris Bailey discusses the basics of predictive analytics: how it is used, how to create a PA model and how to leverage it. The same data could be used to measure a client’s response to a campaign and the likelihood that a client will leave. These educated predictions could have a big impact on your bottom line. The AICPA’s 100th Chairman, Richard J. Caturano, CPA, CGMA, identifies the changes and opportunities in the CPA profession and how they align with marketing needs. What is it like to walk in the shoes of a legal marketing manager? 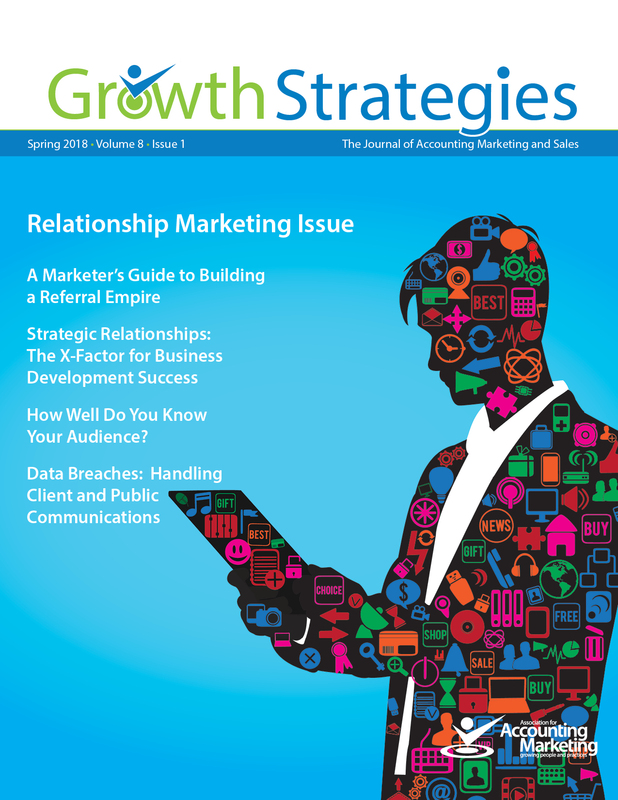 What differences and similarities help or hinder joint marketing efforts between CPAs and attorneys? This article shares the insights of experienced marketers who know how to get things done. Can Marketing and Sales Play in the Same Business Development Band? Can the cacophony of “disconnectivity” between marketing and sales be smoothed into much-needed harmony? Tune into experienced marketing and sales professionals who discuss the key elements in blending their efforts. Then, remix insights from Suzanne Lowe, author of a seminal book on the topic, on how to achieve effective integration. How can professional services firms stand out from the crowd? By building a rock band made up of partners and managers with distinct points of view about issues that matter most to clients, and by harmonizing those messages across multiple channels.